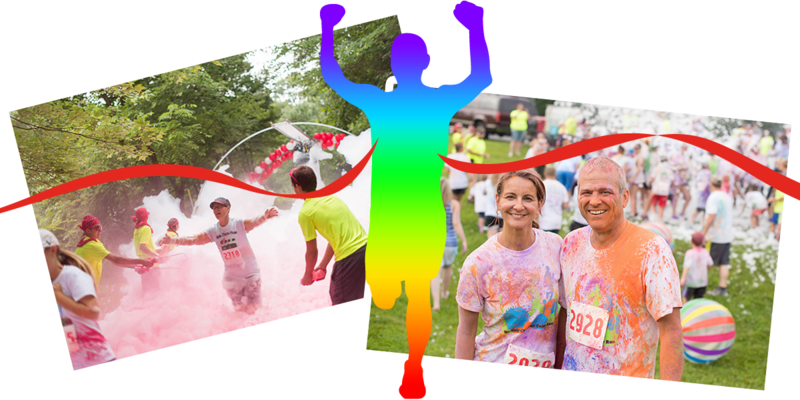 ABOUT THE EVENT / What is the 5K Run To Help Children with color and foam? 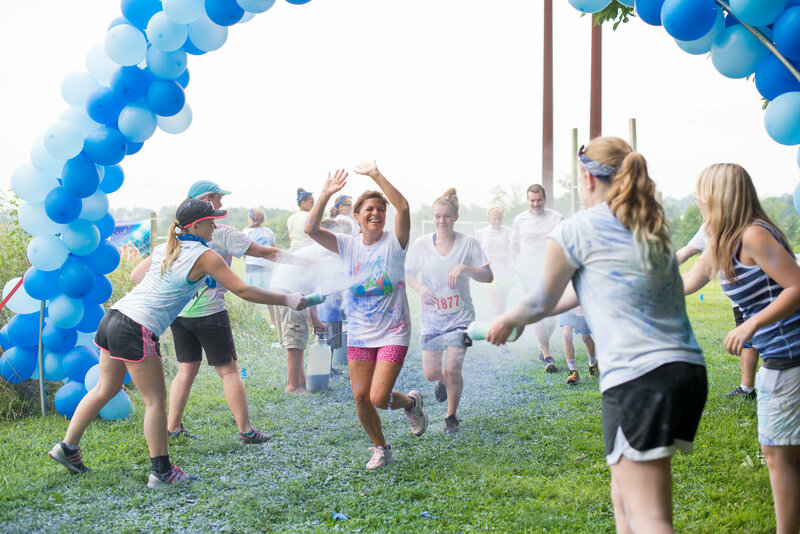 A 5k run/walk that’s more than just another race. It’s an all out fun and crazy adventure that will leave you looking like a walking piece of art. 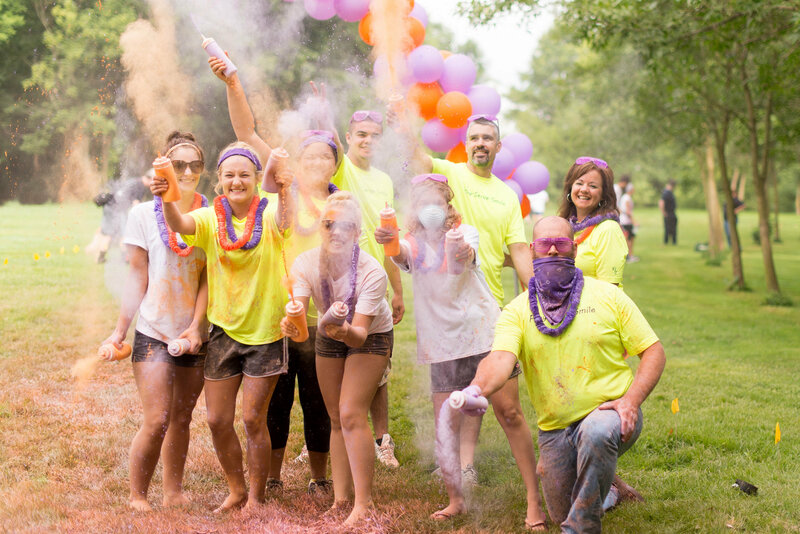 Run, walk or crawl through this 5k trail course and get doused with paint (colored powder) and foam (like a giant bubble bath) at many of the carefully setup color stations along the path. Spend a fun day with family and friends, while helping a great cause! It’s like a festival with a live band, music, an emcee, fun games and competitions before and after the event, prizes to win, food for sale and give-aways! Come enjoy the many booths of our sponsors and get free stuff. Event Schedule / Get ready for a fun day! Register by June 29 for a FREE t-shirt. Mail in registration due by July 13. Registration will be open day of event. Registration opens 1 hour before event time. Event Sponsors / Thank you for your support! Register Now / Join the Fun! 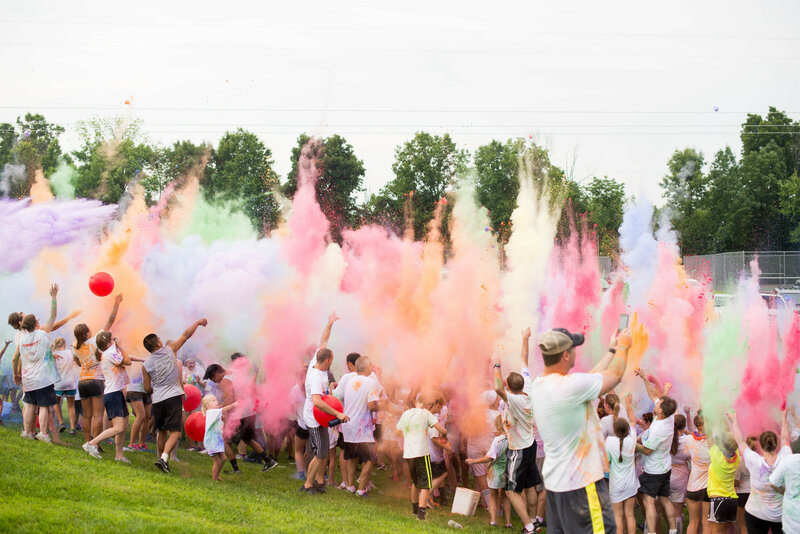 Run to Help Children at Brubaker Park is a color foam run on a 5K trail course. Everyone is welcome, fast or slow, run or walk, old or young. Come and have some fun! This is not a timed event. There are plenty of other great 5K’s out there to test speed and performance. 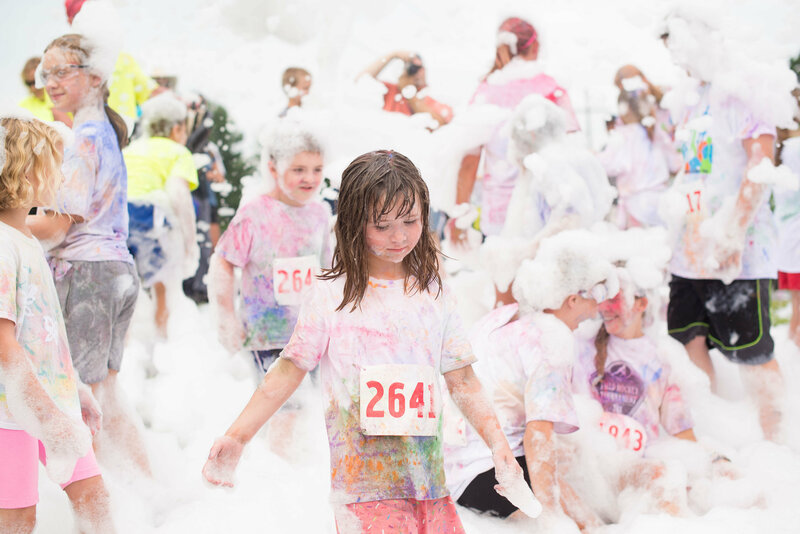 This event is all about getting full of color, covered in foam and having fun with friends and family. You can run, jog, or walk the fun course. We suggest self-timing for anyone desiring a finish time. Everyone is encouraged to wear white so you can show off your color. Color used is basically food grade cornstarch and is 100% natural and SAFE. Foam is a non-toxic, water based solution. We recommend that color participants wear goggles or sunglasses for their eyes and use a bandana or dust mask for their mouths. Note: Color may stain clothing or hair, so you may want to wear a hat or bandana. You may also want to bring a towel to protect your car seat from getting color on it after the run. Our waiver form is posted online www.runtohelpchildren.com for you to read before registering. Each runner will be required to sign a waiver the day of the event before participating. Registered children are welcome to run/walk with their parents, who assume full responsibility for their children. Children under 18 must register/pay and have a parent/guardian sign a waiver on their behalf. Event is held rain or shine! Children 10 & under $30, t-shirt NOT included. Register for $40, t-shirt NOT included, limited may be available for purchase. You may register the day of the event for $40. Online registration is the quickest and easiest way to register. Mail in Registration due by July 15. Visit the information booth to register the day of the event. If you want to, you may want to come dressed similar so everyone knows you are a fun group! You must pre-register your group by contacting us. or send us a message through the contact form. We Help Children is a 501(c)3 nonprofit Charity funded by donations and fun fundraising events like the Run To Help Children. We Help Children in crisis communities, families, orphanages and public schools in Central America and North America, including inner city Chicago. Help children with us! Our Partner / Making a difference! We are happy to support our community partner this year, Locust Lane Riding Center! A portion of proceeds from the Run will go towards helping children in the community through equine assisted therapies at Locust Lane, a local charity specializing in educating, equipping and empowering young people to reach their full potential. Is the paint and foam safe for children? Will the paint or foam stain my clothing? Vestibulum sit amet tincidunt urna, eget ullamcorper purus. Aenean feugiat quis tortor vitae fringilla. Pellentesque augue nisl, condimentum at sem et, fermentum varius ligula. Nulla dignissim nulla eget congue cursus.Vestibulum sit amet tincidunt urna, eget ullamcorper purus. Aenean feugiat quis tortor vitae fringilla. Pellentesque augue nisl, condimentum at sem et, fermentum varius ligula. Nulla dignissim nulla eget congue cursus.Vestibulum sit amet tincidunt urna, eget ullamcorper purus. Aenean feugiat quis tortor vitae fringilla. Pellentesque augue nisl, condimentum at sem et, fermentum varius ligula. Nulla dignissim nulla eget congue cursus. Vestibulum sit amet tincidunt urna, eget ullamcorper purus. Aenean feugiat quis tortor vitae fringilla. Pellentesque augue nisl, condimentum at sem et, fermentum varius ligula. Nulla dignissim nulla eget congue cursus. Vestibulum sit amet tincidunt urna, eget ullamcorper purus. Aenean feugiat quis tortor vitae fringilla. Pellentesque augue nisl, condimentum at sem et, fermentum varius ligula. Nulla dignissim nulla eget congue cursus. Contact Us / Say Hello!